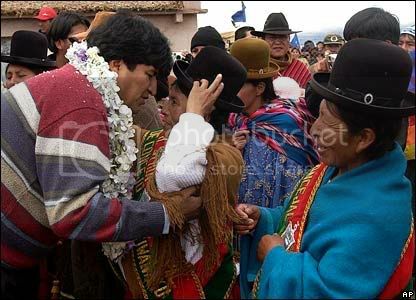 President Evo Morales, the first genuinely leftist (and Aymará) leader of Bolivia is facing not only the usual counter-revolutionary betrayals and plots ignited by his country’s oligarchy, but those fielded by in-country US operatives. The book of destabilization, economic strangulation, social turmoil and military intervention is a time-tested standard manual for this type of “problem” in Latin America, or anywhere someone dares to defy the plutocratic mafia in Washington D.C.
From the Bush Administration’s perspective, that turns out to mean Morales’s opponents. 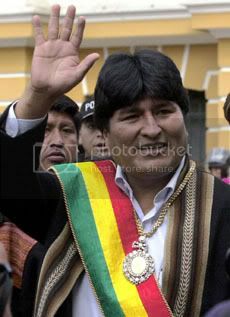 Declassified documents and interviews on the ground in Bolivia prove that the Bush Administration is using U.S. taxpayers’ money to undermine the Morales government and coopt the country’s dynamic social movements—just as it has tried to do recently in Venezuela and traditionally throughout Latin America. Posted in IDEOLOGICAL COMBAT, Latin America and Tagged bolivian revolution, CIA, counter-revolution, evo morales, imperialist tricks, military intervention, reactionary coups, yanquee imperialism.